Any Chuck Conners Fans out there? 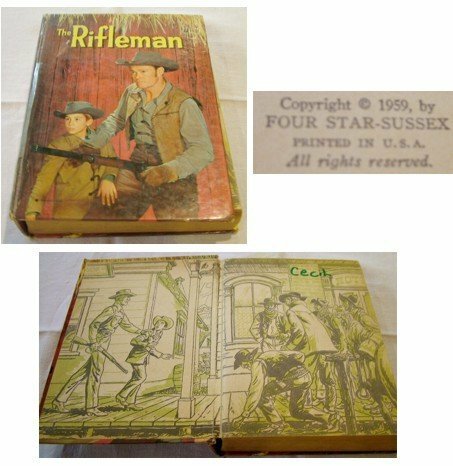 This hardcover book is titled "The Rifleman", based on the television program starring Chuck Conners as Lucas McCain. Written by Cole Fannin, Illustrated by Henry Luhrs. Published by Whitman Publishing Company in Racine, Washington. It has illustrations scattered throughout, sketched in green and black ink. This book was covered in some sort of clear cellophane that is attempting to peel off. The cellophane is curled up and missing in some places. This book appears to have been well loved and well read. A child has inscribed the world "Cecil" on the inside cover in bright geen marker. There is also a quickly scribbled "10/T" in pencil which looks to be a price marking to me. The binding is loosened, the pages are darkened around the edges. This book is over 50 years old and used. But it is entact and in fair condition. It would be a lovely gift for someone who is fond of the Rifleman TV series. Made and printed in the USA by the Performance Years Quality Card Company, Inc. Photos and Commentary by Jerry Heasley. This set is still in it's original packaging, sealed in plastic, and has never been opened. The box itself is bent and dented but I believe the contents is intact. The top of the box has an easy pop-open cover, so I expect it is meant to display the contents and the contents was meant to be sold individually. The top of the box says, "Randomly inserted King of the Hill Series, Commemorative Collector's Edition." 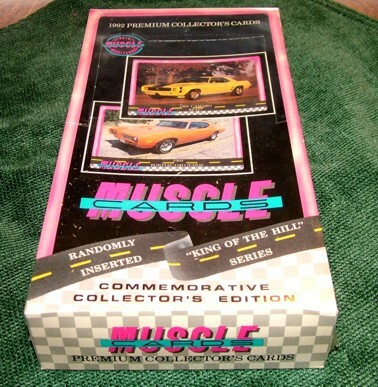 The sides of the box says, "GTO, CUDA, Mustang, Corvette, Camaro, Chevelle, GS, 442, AMX and more." There is no price written anywhere on the box, so I'm guessing it was meant to be used as a display case, for selling the contents in individual packets. This box is at least 13 years old. The box is appx 10 x 5 x 1.5 inches. It weighs 1 lb, 8.3 oz. The contents is in unopened condition.